Time for the third major of The Year Of The Links Major. This one, the purest form of links golf, the Open Championship at St. Andrews. In the last three contests at St. Andrews, the winner has waltzed to victory, with no margin of victory at St. Andrews being less than 5 shots since 1995. Many story lines pervade our senses–will Jordan Spieth take home the third major in a row? Will Tiger Woods find his game at a place that he has previously been a magician? Can Louis Oosthuizen relive his major championship form when it matters in his St. Andrews defense? Can Dustin Johnson bounce back from a terrible loss at the US Open? Horschel (Current Fedex Cup champion) will: gator champ at a patron, causing said patron to throw beer at him. Jimmy Walker (second to Spieth in Fedex Cup points) will: Top10. Miguel Angel Jimenez (LG’s ACTUAL favorite player) will: Make Cut. Nick Faldo (1990 winner at St. Andrews) will: cheat on his wife or girlfriend. Again. John Daly (1995 winner at St. Andrews) will: shirtless JD at St. Andrews? Can it be true? Tiger Woods (2000 and 2005 winner at St. Andrews) will: Top10. Great showing, can’t quite get it done. Louis Oosthuizen (2010 winner at St. Andrews) will: Just outside the Top 10. He’s doing good right now. Rickie Fowler (2015 Scottish Open Champion) will: wear orange on sunday? Will Rory McIlroy make an appearance? Nike, Omega, the PGA of America….yeah, he’ll be there…in recording at least. In preparation for this year’s second major, we boldly offer our US Open Predictions 2013. Will someone win it, or will everyone else lose it? : Phil lost it, but Rose won it too. Alright LG, time to put it out there. There’s a lot of discussion lately about belly putters. More appropriately, there’s a lot of discussion about what to do about them. After going decades without single mid-length putter or long-putter winnings on Tour, now the belly putter is taking the Tour by storm. Three out of four of the current major champions used belly putters to win (Keegan Bradley, 2011 PGA; Webb Simpson, 2012 US Open; Ernie Els, 2012 British Open). Bubba Watson (2012 Masters) is the only current major champion who did not use a belly putter to win. So there are many questions to answer here, but to me, the main point boils down to: 1) is it an advantage? if so, 2) what should be done? Some people are just antithetical to belly putters and long putters in general. While neither you nor I use them–and I personally find them to be a bit distasteful–I do see a need in golf for them. Many amateur-level players need a way to make the game fun. Poor putting can often thwart someone’s progress as a golfer, and a long or belly putter may give them the stability they need to get over the hump. For example, when my wife’s grandfather played, he wasn’t in good enough health to lean over a putt, so he got a long putter and stopped 3-putting EVERY green (he still did 3-5 times per round, but way less than previously). I think the more important point, though, is that belly and long putters really don’t give a “better” player much of an advantage. No matter the golfer, the person must still read the putt, account for the speed, pick the line, and set up to it properly before any mechanics of the stroke happen. The ability to do this successfully comes after hours and hours of practice that a “good” player will put in regardless of the length of putter he/she uses. To put it another way, the belly putter didn’t read the 35-footer that Keegan Bradley hit on the 17th hole at Atlanta Athletic Club–the player did. The player read it, accounted for the speed, picked the line, and let the put go on that line. Further, I don’t think a longer putter shaft REALLY makes it all that much more stable for the better golfer. Adam Scott bogeyed the final four holes at Royal Lytham & St. Annes largely because he picked poor targets and failed to execute the mental part of his putting routine, not because he was using a long putter instead of a belly putter. Webb Simpson’s putter didn’t make Jim Furyk pull his fairway shot in the bunker on 18 at Olympic or make Greame McDowell miss his birdie attempt by a mile and a half. Am I missing something? Opponents of longer-length putters say it helps stabilize the stroke. That may be true, but at the same point, it prevents someone from using his or her athleticism to correct in small variations, such as when precise speed is needed, or when the player plays from the edge of the green and needs to blade the putt a little bit. I’ve practiced with a belly putter before, and I do see some stability improvement. But the stability improvement is far outweighted by the inability to control the distance, for me at least. In my view, there is little to no real advantage in belly putters. I see it more as a mental advantage that some people will find helps their own games. Maybe some people will play better with them, but I firmly believe that others (like me) won’t. Just like all of the other equipment tweaks one can make (shaft flex, various grips and sizes, cavities vs. blades, groove changes, ball changes, etc etc etc etc etc), I see the putter shaft length and stroke method as just another option that a player can choose to make his or her game better. That’s what it’s all about, right? For two reasons, I don’t think long putters should be allowed. First, we should look to the game itself. For me, golf is about using using a club to move the ball closer to the hole. While this might seem to leave some room for a belly putter or long putter, the image just seems to go against what golf is all about. When I think “golf swing,” I can’t imagine an athletic motion taking place with an anchored club. No other club is anchored to the body in “golf,” so it makes little sense to allow it for the putter, in my view. For that reason, I don’t think it should be allowed in competition. Second,I think there is advantage and long putters should probably not be allowed in competition. Golf is a mental game. Putting is the strongest mental test given that it requires the least athleticism. It takes a lot of skill and nerve to make short putts that matter. I am inclined to believe that long putters provide a mental crutch to players that use them on those kinds of putts because they have the knowledge that they will make a fluid stroke based upon their equipment, not their practiced routine. In that way, they provide an advantage (whether real or not). While you can pretty easily point to Adam Scott’s performance in the 2012 Open Championship to counter this, the point isn’t players with long putters can choke, but rather, he choked DESPITE having that mental advantage. Read: double choke. At the highest level in the game, the point is to test your mental fortitude, not your ability to make a 4 footer. No one in the entire world would (or should) bet against Adam Scott on any given 4 foot putt, but that putt becomes harder when it means you win or lose the title of “Champion Golfer of the Year.” For a player to have a mental advantage over another based upon the equipment they are playing rather than the time spent on the practice green is what bothers me about the long putter and why I think it should not be allowed in competition. That being said, I think they can be great learning tools to learn a fluid putting stroke. Often, players like Ernie will switch back and forth between a standard putter and a long putter to get a feel for a good putting stroke. I’m all for using them in a practice round. I’m all for using them on the putting green. I think you and I agree on the fundamental point; Long putters just aren’t golf. I agree that long putters and belly putters “just aren’t golf,” but I’m less opposed than you. The entirety of golf is about selecting equipment that maximizes your game. We do it with drivers; we do it with golf balls; heck, we do it with shoes. Every little thing to get an advantage makes sense. Some people had this “ban it” mentality when metal woods came out or when cavity-back irons were developed. Slowly, those things have become part of the fabric of the game to where no one would think of using a non-metal driver and cavity-back irons are almost universal. Even the classic “PING Anser” putter was looked at with shame originally but now is the most ubiquitous design available. While I see your point, I think it’s just part of the natural progression of the game. 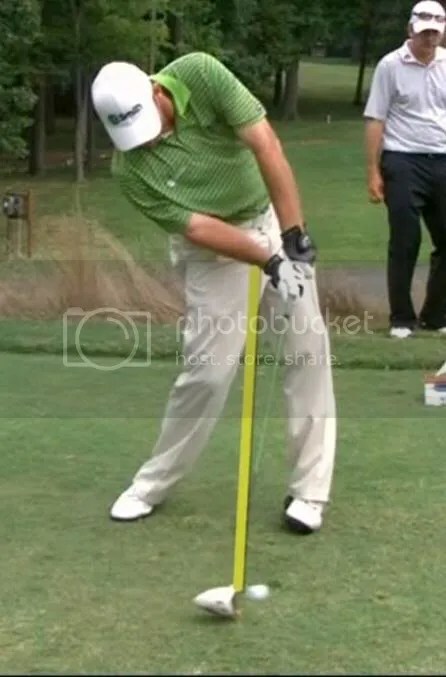 If you’re wanting to ban something, ban the way Tommy “Two Gloves” Gainey swings a golf club. That’s way more offensive than a belly putter. This week’s POTW goes to none other than Jason Dufner. Now, I know what you’re saying. 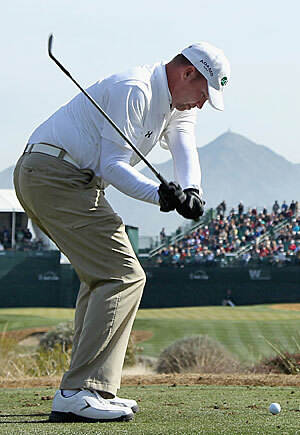 Dufner just looks…bleugh. And until this week, I probably would’ve said that there isn’t much to be excited about with this guy. But watching him play yesterday, I found myself rooting his way, and, for what reason, I don’t know. To look at the guy, you wouldn’t think he was an athlete of any kind. To watch him play, he certainly doesn’t inspire confidence in American golfers. But what Dufner loses with a shy, internalizing personality he makes up for with amazing ballstriking, short game, and a remarkably good overall game. Dufner played his college ball at Auburn, mastering the Robert Trent Jones Golf Trail. He finished runner-up to Trevor Immelman in the 1998 US Amateur Public Links. And, more recently, he finished second at the PGA Championship to Keegan Bradley, who practically knifed him right there on the golf course. Few people could come back from that. Even though Dufner hadn’t come through the ranks for a win, his game is clearly tremendous. A guy who can shoot -19 in a tournament while posting a final round 70…that’s pretty amazing. While he might not have that striking and shining personality that we love to see from guys like Phil and Tiger, he also isn’t faking it. This guy is who he is, and who is he is…well, that’s one heck of a golfer. To you, Jason Dunfer, many congratulations. Also, a mini-POTW shout out to Ernie Els. Although Big Easy didn’t break through at the Zurich Classic and ended up falling in the playoff to Dufner, this is the first time we’ve seen him in contention in a long, long time. It’s good to see one of the classic swings of the game back in contention. Maybe we’ll harken back to the good ole Tiger/Phil/Vijay/Ernie days, back when golf was really, really exciting. Here’s to you, Big E.